1. Why did you want to perform at L Fest? It has an absolutely awesome vibe. I also love the family feel of the festival. I adore Cindy, she’s an incredible woman and you don’t turn her down! 2. How did you get involved with the L Project? Georgey is also an amazing woman and a great entrepreneur and I knew that it would be a wonderful project to be involved in. I have never been bullied for homophobia, but I thought that it would be great to do something that supports those who do suffer. It really hit home when we were recording the track. Some of us already knew each other, but it was good to hear everyone’s stories and some of them were truly heart breaking. What is really incredible is that they are all now on stage and beating the bullies. It’s a real two fingers up to the homophobes! When I went home in the evening after recording, I couldn’t talk about it as I was so emotional and it was such an intense experience. All the artists involved now have an incredible bond we all made some true friends. There has been an astonishing response to the project. The feeds we get on Facebook are amazing and it’s humbling how people are affected by it. It has actually saved lives! What’s brilliant about it is that it is not about us; it’s about them! 3. What is your music about? It’s music that actually inspires me to write lyrics. I get a feel of a track and that’s what inspires me to write the lyrics. There isn’t really a particular ‘theme’ to my music. 4. Do you think a person’s sexuality should be mentioned in your industry? It can be difficult to mention your sexuality. 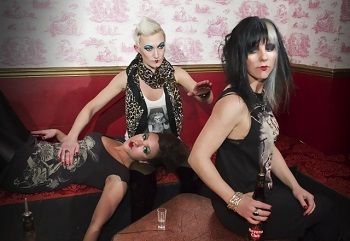 When we get called a ‘lesbian band’ it does get my back up a bit as it takes away from our music. Our sexuality does not define the music. Guess what straight people listen to us too?? We get packed out in straight venues just as much as we do at gay ones. There is often a drive for people to label themselves. Still, I do understand that many do need a label in order to identify who they are. 5. What is your definition of true love? My wife! She’s just perfect and I think that she is the most beautiful woman in the world. She makes me proud every day. We had a civil partnership after 7 years together and it’s our 13 year anniversary today! We are not in any rush to marry as we are not religious and there isn’t a great difference. In our 13 years she has been to every single one of my gigs (in the 1000’s). We were together constantly from our first date, standard lesbian behaviour but neither of us proposed to each other we just always knew. 6. What are the qualities that your wife has that are important to you in a partner? It is about having that special energy. She is open, honest, kind, intelligent and lovely to look at! We are constantly laughing and we never argue. Yes there are a few disagreements, but that’s nothing. 7. What suggestions would you give to a woman who wishes to follow her dreams? You need to be yourself 100% of the time and have integrity. Never stop working for what you want, even when it seems unfeasible. You only get one chance at this life so it’s imperative that you make your time count. People can judge you, but it doesn’t mean that they are right. You can do what you like as long as you do it with conviction.